This eight week introductory course in pointed pen calligraphy is designed especially for beginners, no prior calligraphy experience is required. This class will start with an overview of tools and materials as well as the essential principles of Copperplate. Students will learn the principle strokes, lower and uppercase letterforms, as well as numbers and symbols. Students will learn how to format envelopes and will create a small calligraphed piece. Assignments are given each week, and a minimum of three hours of practice at home per week is recommended. Joy provides personalized feedback on all homework pages on a weekly basis. This course will be taught primarily in English, with bilingual handouts, worksheets, vintage exemplars and an extensive resource guide. An eight week continuation course in pointed pen calligraphy, for students who have completed Joy’s introductory class. Students will continue their study of traditional Copperplate letterforms and eventually move on to explore modern variations as well as layout and design. Students will learn how to use a variety of mediums such as white ink, coloured gouache, watercolour and brush pens. Students will design and complete a final calligraphed piece, incorporating the new techniques they have learned. This course will be taught primarily in English, with bilingual handouts. Private lessons are a great opportunity for individuals who would like one-on-one instruction. 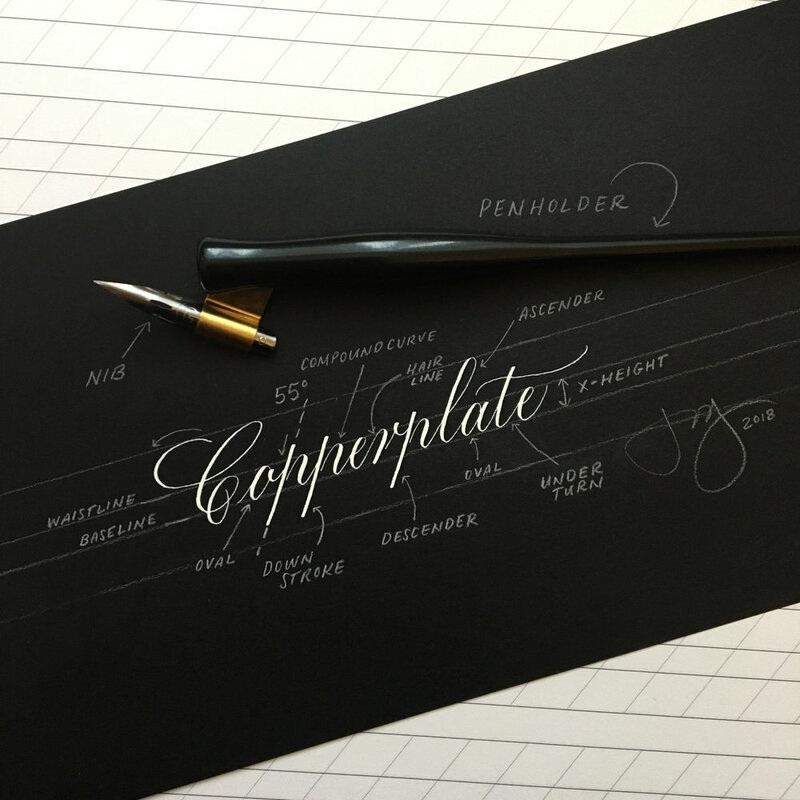 The first lesson consists of a brief history of Copperplate, overview of materials and setup as well as an introduction to the principle strokes. Students will learn how to construct lowercase and uppercase letterforms, as well as numbers and symbols. The pace of each lesson will be tailored to the progress of the student. Private lessons are scheduled on weekdays at Joy’s home studio in the Mile-End. *Please note that classes will resume in 2020. Joy always announces registration to newsletter subscribers first. Sign up below to receive advance notifications about upcoming classes and workshops.